"Someone called speaking funny Japanese"
Os Gemeos Site is up!! Grand Opening Forever 21 in Tokyo!! Richard LaMotta, who turned his childhood passion for dunking cookies in milk into the Chipwich — two chocolate chip cookies embracing a chunk of vanilla ice cream dotted with chocolate chips — died Tuesday at his home in Chappaqua, N.Y. He was 67.The cause was a heart attack, his daughter Kayla said. On May 1, 1982, Mr. LaMotta dispatched 60 street-cart vendors, each wearing pith helmets and khakis, to the streets of Manhattan to begin selling his 4 1/2-ounce concoction (including 3 1/2 ounces of ice cream) for what at the time was a pricey $1 each. A few hours later, all 25,000 Chipwiches had been gobbled — the start of something big. Within two weeks, Mr. LaMotta was selling 40,000 a day, and by the middle of that summer, the Chipwich plants in Queens, N.Y., and Lodi, N.J., were turning out 200,000 a day. It didn’t hurt that Mayor Edward I. Koch posed for a photo — for no fee — as he bit into a Chipwich.Soon there were imitators, banking on the legal position that they could make a Chipwich-like product, using similar ingredients, as long as they called it something else; among them were Chilly Chips and Chips ’n’ Chips. Still, Mr. LaMotta did well. By the time he sold his company to Coolbrands International, a Canadian distributor, in 2002, more than a billion Chipwiches had been sold by approximately 3,700 vendors in 36 markets. The brand was eventually bought by Nestlé, which stopped making the product because it competed with its own version, Ms. LaMotta said. Mr. LaMotta’s first marriage, to Rosemary Tadlock, ended in divorce. In addition to his daughter Kayla, he is survived by his second wife, the former Elaine Nadel; another daughter, Marika; a son from his first marriage, Thomas; and a granddaughter. Though he first dipped cookies as a toddler, it took nearly four decades before Mr. LaMotta found his true calling. For 12 years, while studying at night for a bachelor’s degree in economics at Brooklyn College, he had worked as a video and sound engineer for AT&T and CBS. In 1975 he earned a law degree from New York Law School. Instead of practicing law, he went into what would eventually be a series of businesses, including one that sold food through catalogs and another that created a digital printing system for converting photographs into oil paintings. But in the late 1970s a friend in need of financial support asked Mr. LaMotta to become a partner in the Sweet Tooth, an ice cream parlor in Englewood, N.J. There, and in the basement of his father’s home in Brooklyn, he began experimenting with ingredients for a perfect marriage between cookies and ice cream that would keep the cookies from getting soggy during the freezing process. It took a lot of taste-testing for Mr. LaMotta, a somewhat rotund man at the time. 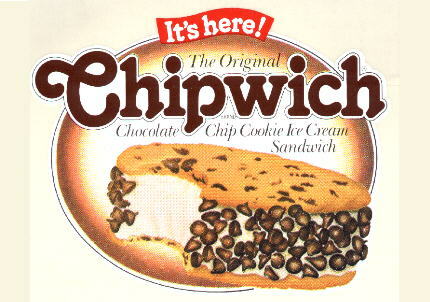 Although the ice cream parlor eventually went out of business, Mr. LaMotta was able to raise about $500,000 from friends to start Chipwich Inc. In 1981, as sales started climbing, he told The Times that he could not foresee selling the company. “I have devoted 20 pounds of my life to Chipwiches,” he said. Now Get a Chipwich and celebrate A Brooklyn Great. brooklyn boy trough and through.